Dirty CCD/CMOS sensors can cause unwanted time behind the computer editing out annoying spots and debris from your digital images. Sensors do get dirty and need periodic maintenance. In the old days if a speck were to get onto the negative in a film camera it would show up on that frame only. When the film was advanced to the next frame the speck went along with the film. Advance to the present... The same specks still penetrate the camera through the shutter and other openings of the camera. When this happens the single speck that would show up on a single frame in film cameras shows up on all frames of a digital camera. After awhile multiple specks build up on the sensor and requires cleaning. To avoid needless hours behind the computer screen it is important to have your sensor checked and/or cleaned on a regular basis. In addition to cleaning the sensor our Lead Technician will clean the exterior of your digital camera body including the LCD windows and Mirror Housing area. We take an image of a white light source before cleaning which shows the dirt on the sensor and take a photo after cleaning the sensor that shows how clean the sensor came. Copies will be left on the customer's media card as well as a copy kept on file at Northwest Camera Repair. We use Manufacture's AC Power Supplies, Sensor Scopes, Speck Grabbers, PecPads & Cleaning Solutions to insure your CCD/CMOS Sensor is clean. We also offer a 30 day warranty on Sensor Cleanings (1 re-clean only). To get the best performance from your equipment, we recommend that professional photographers have their sensors cleaned once every 2 to 3 months or sooner depending on the type of environment the camera is used in and once every 3 to 6 months for amateurs and lightly used equipment. If you are unable to visit Northwest Camera Repair and would like to ship your camera in for cleaning carefully wrap your camera in a plastic zip lock bag and pack it in a sturdy box with plenty of padding material around it. Be sure to include a fully charged battery and leave a formatted media card in the camera. After professionally cleaning your camera sensor we will carefully package it and return it to you. Shipping and insurance charges will apply - rates vary. 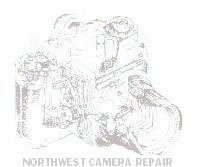 Please contact Northwest Camera Repair for any inquires you may have.